Already the first Cafirta Games U20 Boys 100m medalist in the territory’s 43-year history of competing in the event, Rikkoi Brathwaite added to his growing but impressive resume over the weekend, highlighting BVI athletes regional and conference championships performances. 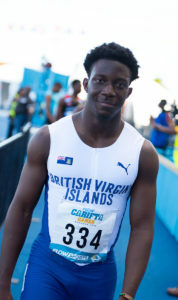 Brathwaite became the first BVI U20 male athlete to qualify for two IAAF World Jr. Championships sprint events, following double weekend victories at the Billy Haynes Invitational in Bloomington, Indiana. Already an IAAF World Juniors 100m qualifier en route to a Carifta Games 100m bronze medal last month, Brathwaite completed his double sprint victories with a 200m personal best of 21.21 seconds, lowering his best from 21.40, set during last month’s Carifta Games. He won the short sprint with a time of 10.53 seconds after advancing with 10.56. Running in the NJCAA Region I Track and Field Championships in Mesa, Arizona, Central Arizona College sophomore Tarique Moses ran a 400m season’s best of 49.78 seconds and finished seventh overall. He was fourth in his 800m heat in 2 minutes, 03.72 seconds, the 10th best mark of the competition. In other regional action, after helping his 4 x 800m relay to a second place finish with a time of 7 minutes and 46.70 seconds in the NJCAA Region VI Track and Field Championships and qualified for next week’s National Junior Colleges Championships, Barton County College freshman Adriano Gumbs helped his team qualify in a second event. He completed the championships with a third leg carry on the 4x400m relay that won in 3 minutes, 10.67 seconds, helping Barton to repeat as Region VI champions, their 22nd over regional crown. In between the relays, he was sixth in his heat and 11th overall in the 400m. Gumbs finished with a time of 49.39 seconds. Houston Baptist junior Taylor Hill, recorded a non-advancing time of 12.34 seconds in the 100m prelims at the Southland Outdoor Conference Track and Field Championships in San Antonio, Texas. She led off the eight placing 4x100m relay that was timed in 46.74 seconds. Meanwhile, at the Tom Tellez Invitational in Houston, Texas, Josh Hill ran 49.13 seconds to place sixth in the 400-meters.